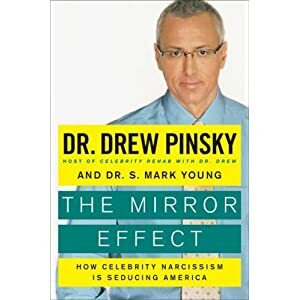 Book 10: The Mirror Effect: How Celebrity Narcissism is Seducing America, by Dr. Drew Pinsky and Dr. S. Mark Young. Oh Dr. Drew. So handsome. Killer blue eyes. An engaging speaker, that time Jeff and I got front-row seats (!) at Chico State. Le sigh. But oh Dr. Drew, your books. They're not good. I read another of his books, Cracked, about his experiences working as a physician in rehabs. That one wasn't good, and this was a disappointment, too. The book, at 267 pages, could have been half as long and still gotten its point across. The first 100+ pages were spent presenting the problem of "celebrity narcissism" - as if it really takes 100 pages to tell people that celebrities are narcissists, and to explain what narcissism actually is. The book is based on a study that Drs. Pinsky and Young did where they had celebrities take the Narcissistic Personality Inventory. Predictably, celebrities score notably higher on the NPI than "average" people. Drew outlines causes for this and the consequences for today's youth.